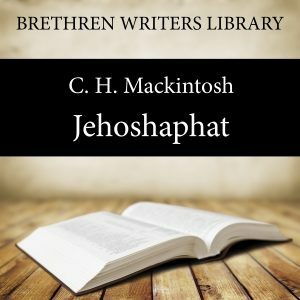 ‘Jehoshaphat – Worldliness’ looks at the life of this Old Testament King of Judah and encourages us to examine ourselves in the light of his mistakes. When a Christian enters into connection with the world, he lays himself open to be "persuaded" by the world, to enter upon an unchristian course of action. "Keep thyself pure" is a valuable admonition for us all. "Come out from among them, and be ye separate" Let us ask ourselves, Can our association with the world go hand in hand with our fellowship with God? This is really the question. The man who conforms to the world will be the enemy of Christ, and the enemy of Christ's people. It cannot be otherwise. "The friendship of the world is enmity with God; whosoever, therefore, will be a friend of the world is the enemy of God. "How fully was this proved in the case of king Jehoshaphat! He became the friend and companion of Ahab, one of the most evil kings in history. The beginning of evil is like the letting out of water. Small beginnings lead to fearful results. Dear Christian reader, let us, with the Lord's help, endeavour to shake off the world's influence, and purge ourselves from its ways. We have no idea how insidiously it creeps in upon us., "Take heed what ye do." "Come out, and be separate." We cannot, by any possibility, mix ourselves up with the world, and allow ourselves to be governed and led by its maxims and principles, without suffering in our own souls, and marring our testimony. A word about the author: C. H. Mackintosh,was born in October 1820, in County Wicklow, Ireland, and is generally known as C.H.M., which is all that appeared on the title pages of his major writings. He was one of the major evangelists and Brethren authors of the 19th century. CHM was converted when he was 18, he briefly farmed and then ran a school before fully committing himself in 1854 to serving the Lord whom he so fervently loved. The rest of his life he spent very actively preaching the gospel to the unsaved and presenting sound ministry both in writing and preaching, travelling widely in the British Isles and living in a number of towns in Ireland and England. He was very active in the Ulster Revival of 1859. His writings are easily understood and were particularly influential among North American evangelicals. He also edited for a number of years a magazine called Things New & Old, which had a worldwide distribution and reputation. He was called home on November 2nd 1896. But to deal thus with evil requires much exercise of soul before God — much spirituality, much self-judgement, much prayer and watchfulness. The Lord grant us these, and also more tenderness and godly sensitiveness of conscience. if a Christian be walking loosely or carelessly — if he be out of communion — if he fail in prayer, in watchfulness, or in self-judgement, he is really injuring the whole body; and, on the contrary, when he is walking in spiritual health and vigour, he is promoting the blessing and interest of all.